Because revising a foreign language on your own can be quite challenging, we put together an intensive course to cover everything you need to know for your Junior Cert exam, in a day. Just a couple of weeks before the exam, this is the perfect opportunity to go over everything with a qualified native French teacher. 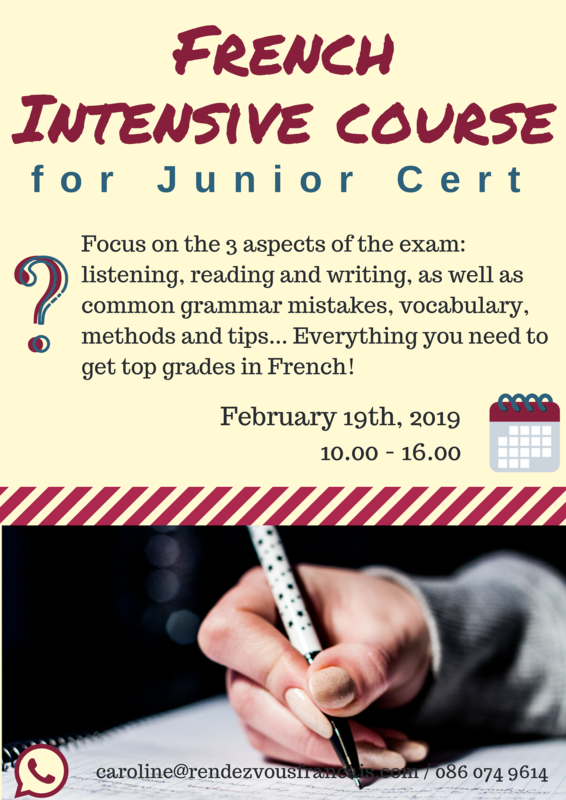 Our Intensive course will focus on the 3 aspects of the exam: listening, reading and writing, as well as common grammar mistakes, verbs, vocabulary, and plenty of tips… Everything you need to feel best prepared, confident, and get top grades in French! We allow a maximum of 8 students, contact us soon to book your space! The course will run from 10 am to 4pm. There will be a 30/45min lunch break: students can bring their lunch or go into Navan town during the break.